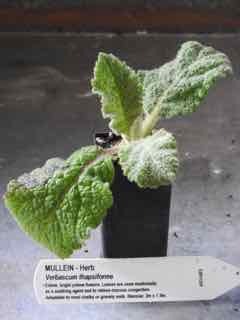 Mullein plant, Verbascum thapsiforme, is sometimes known as Great Mullein. Edible, bright yellow flowers used in salads. The leaves are used medicinally as a soothing agent for sore throats, bronchi and lungs. Relieves mucous congestion. This ancient herb was reputed to drive away evil spirits. A few drops of the essential oil is a topical treatment of earache. Tall seed stalks make an attractive dried flower arrangement. Mullein plant is a native of Europe and Asia and is adaptable to most chalky or gravely soils. Yellow flowers appear in summer. A biennial plant, growing to 2m x 1.5m. Be the first to review “Mullein, plant” Click here to cancel reply.